IICT Hyderabad Recruitment 2018: Indian Institute of Technology has issued official notification for 32 vacancies of technicians. Eligible and skilled candidates are able to send Indian Institute of Technology Job 2018 application through online mode from Indian official website iictindia.org. Interested candidates may apply online for the IICT Hyderabad Technician vacancy 2018 till the last date of 08.12.2018. Candidates can download official notifications from the official website before applying for this vacancy. 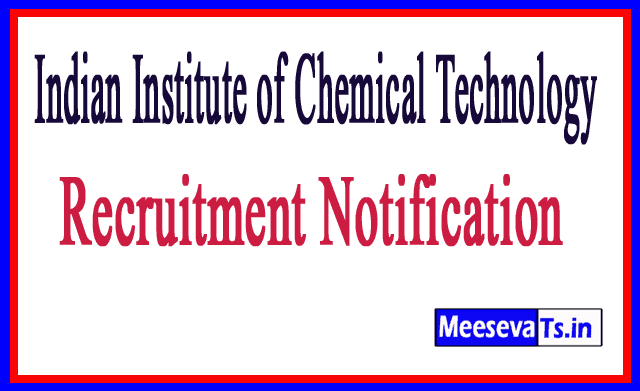 For more information about recruitment of Indian Institute of Chemical Technology, such as education qualification, age limit, selection process, application fee and how to apply, important links, courses, admission letter, results, last letter, eligibility details given below. Such as eligibility details. The total number of vacancies filled by CSIR - ICT is 32 posts. Applicants must pass SSC / 10th Standard with 55% marks in the form of trainee training from recognized organization / board and ITI certificate or national / state business certificate or 2 year full time experience with science subjects. Selected candidates will get 29, 871 / - per month from the organization. Look around for "Technician positions for IICT Hyderabad recruitment 2018". Interested and qualified candidates can download the website from iictindia.org in the prescribed form and send your application on or before 08.12.2018. The prescribed format with photocopy of all relevant documents should be submitted to the address specified below.